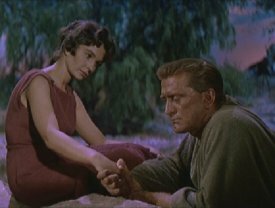 In 1959, two weeks into filming on Kirk Douglas' Roman slave rebellion epic SPARTACUS, Simmons signed on to replace German actress Sabine Bethmann as Spartacus' wife Varinia. 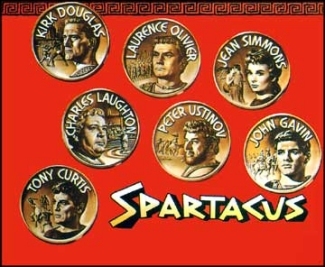 Also featuring Laurence Olivier, Peter Ustinov (both with Simmons at right), Charles Laughton and Tony Curtis, the film earned four Oscars and was a box-office smash. 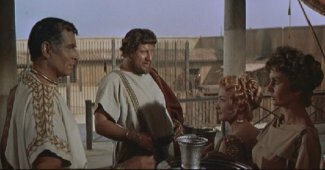 Once again, amidst award-winning sets, epic battle sequences, and heavy-weight performances from her male co-stars, Simmons manages to hold her own in SPARTACUS. Her onscreen chemistry with Douglas (left) proved magnetic, and her warm, heartfelt performance added a much-needed touch of humanity to the film. "Love Theme" (clip) by Alex North (a .MP3 file courtesy MCA Records). "Prelude to Battle" (clip) by Alex North (a .MP3 file courtesy MCA Records). 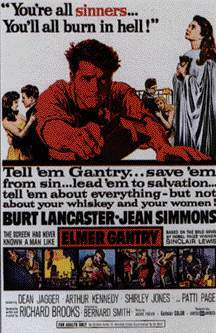 In one of the most impressive performances of her career, Simmons next took on the role of Sister Sharon Falconer, a 1920s Midwestern evangelist whose revival circuit is joined by Burt Lancaster, a drunk, skirt- chasing, traveling salesman, in ELMER GANTRY, the highly controversial Best Picture nominee of 1960. Lancaster (as the title character) takes over Sister Sharon's flock with his gift of oratory in an Oscar- winning performance, but Simmons (unjustly overlooked for a nomination) again holds her own as the innocent, devoted evangelist tempted to ruin by Gantry's excesses. Also featuring Shirley Jones, this film was made before MPAA film ratings, but United Artists advised exhibitors not to admit anyone under sixteen due to what it deemed the "adult nature" of the film. Further, the issues it raises continue to be potent today. 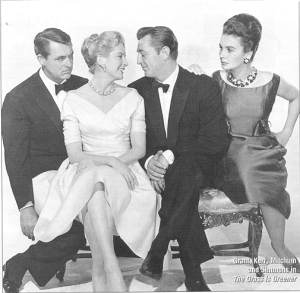 Also in 1960, Simmons joined Cary Grant, Deborah Kerr and Robert Mitchum in THE GRASS IS GREENER, a delightful drawing room comedy about an American tourist (Mitchum) who threatens to break up the marriage of an aristocratic English couple (Grant & Kerr) when he takes a guided tour of their castle. Simmons is a delight as Kerr's flighty, flippant, flirtatious best friend who attempts to counsel her about her new-found romance. The film itself is obviously adapted from a play, but the lines are so fun one hardly notices the staginess. See the Original Theatrical Trailer for THE GRASS IS GREENER (a .MOV file courtesy AMC).